We’ve all been there before…Eyes shut but mind open. Tossing and turning all night long, whilst avidly watching the hours of the clock increasing and our total potential sleep time decreasing. Statistics tell us that approximately 9% of Australians experience common sleep disorders, and nearly all of us struggle with some degree of disordered sleep symptoms throughout our lifetime, so here’s one of those newsletters you can ear mark for a time it might come in handy (but hopefully won’t). First of all, it’s worth noting that there is not a whole lot that we actually know for certain about sleep. We do know that every species on earth does it, and that we can’t survive without it (random fact: the average adult spends one third of their life asleep). We also know that sleep is fundamental to maintaining good physical and mental health and that a lack of sleep negatively affects our cognitive function, such as our memory, attention, and learning (although we don’t quite know how). Regulate your sleep schedule: wake up at more or less the same time each day (even on weekends). This helps set your biological clock. Use your bed for sleeping: Keep other activity in bed to a minimum (such as watching TV, doing work, reading etc). This helps associate your bed with sleep. Avoid caffeine, alcohol, nicotine, and exercise at least 4-6 hours before bed. They will interfere with your ability to fall and stay asleep. 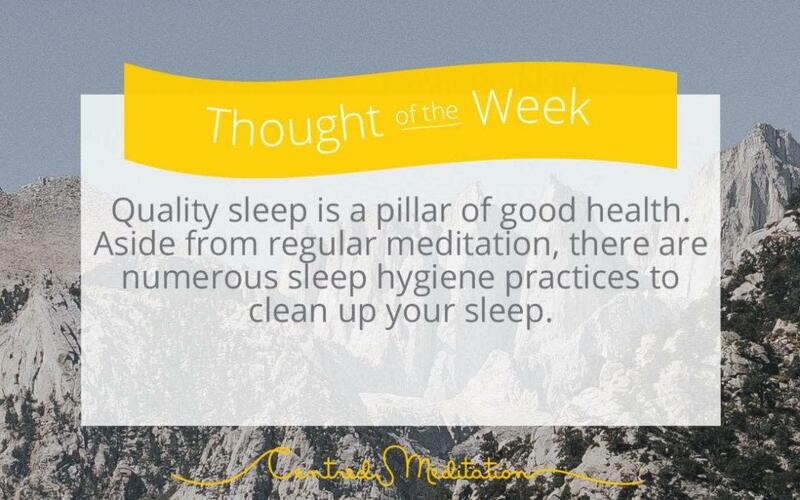 Meditate: A daily meditation practice has been shown to improve your sleep onset and quality (N.B. you don’t need to meditate before bed to have the positive effect – in fact doing a full 20-30min effortless meditation right before sleep can have the opposite intended effect). Unplug from devices at least two hours before bedtime: the blue light from screens activates the photoreceptors in your eyes, tricks your body clock into thinking it’s daytime, and suppresses melatonin (the important sleep hormone). Develop a bedtime ritual: this will signal to the body that it is almost time to sleep (relaxing stretches, meditation etc). Optimise your sleep environment: keep your bedroom dark, cool, and quiet (which is more conducive to sleep). Try using a dim, or red light in the bathroom and bedroom when preparing for sleep. Don’t spend too much time awake in bed: only head to bed when you feel tired and if you can’t sleep after 20 mins or so, get up and do something calming (like meditating) or non-stimulating (like colouring-in) until you feel sleepy enough to return to bed. Avoid watching the clock. This only serves to stress you out more. Ensure your tummy is settled: don’t overeat nor have an empty stomach before bed. Both can interrupt sleep. Be sure to check out Sleep Hub for more resources and a great podcast on sleep as well A Mindful Way for a mindfulness program to overcome insomnia . *Please note that disordered sleep is often a proponent of mental health issues and thus should be addressed with professional help.